Not many people think to visit zoos in the winter. But both our zoos, Como Zoo & Conservatory and Minnesota Zoo, are open year-round and offer indoor exhibits when you want to step out of the cold. It’s a perfect family friendly activity when you’re experiencing a touch of cabin fever. At the Como Zoo & Conservatory—one of the last free metropolitan zoos in the country (donations appreciated)—you can spot giraffes, gorillas (come back in 2013 to see their new home), orangutans, penguins, and my personal favorite, Neil and Buzz, the polar bears. The bears’ brand-new exhibit space offers you a chance to get up close and personal to these arctic animals. After a visit to the animals, head into the adjacent Marjorie McNeely Conservatory. The Marjorie McNeely Conservatory was constructed in 1915 and holds a place on the National Register of Historic Places. 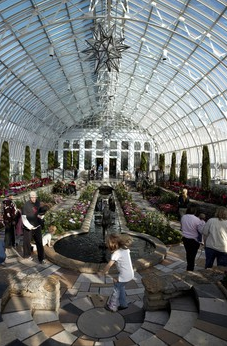 The conservatory showcases half an acre of greenery under the glass of its seven indoor garden rooms. Tropical Encounters brings visitors inside a neotropical rainforest (try to spot Chloe the sloth or the anaconda) while other rooms feature palms, ferns, orchids and Bonsai. The Sunken Garden presents five seasonal flower shows each year. This month, enjoy the Winter Flower Show (closes March 18), a display of azaleas, clyclamen, veltheimia, amaryllis, cineraria and more. It’s a perfect way to warm up on a chilly winter day and get a taste for spring. For a peek at what’s in bloom during this year’s Winter Flower Show, watch the short video below.